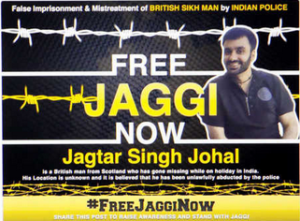 The gangster-like behavior of Indian authorities in arresting a Scottish born Sikh Jagtar Singh Johal for ‘influencing the youth through social media’ is a matter of major concern to the British Sikh community. We understand Mr. Johal’s crime was highlighting Indian government atrocities in 1984. There appears to be little other information about the circumstances surrounding his case, other than the nature of his arrest and his handling by Indian authorities. Mr Johal was on holiday in Punjab, when according to reports he had a sack thrown over his head and was bundled into a van. Days later, his newly wed wife and family were told he had been arrested. We like his Member of Parliament Martin Docherty-Hughes, want to make sure Mr Johal is treated fairly, his family is updated about his whereabouts, and that he has access to legal representation in the event the case against him progresses. Our Director Lord Singh, will be writing to the Foreign Office to flag his concerns. It cannot be right that a British citizen is treated in this way, his family deserves answers and his wellbeing is paramount. Following the 2014 disclosures from The National Archives under the 30-year rule, there are two things clear about the Thatcher government’s role in events leading up to the storming of the Golden Temple in 1984. Firstly, the then government dispatched an SAS officer to provide military advice to the Indian Army in the run up to the attack in Amritsar (codenamed Operation Blue Star). Secondly, the British dispensed with human rights in order to secure lucrative military contracts with India, in particular the Westland helicopter deal. We believe there is little more to be gained from a full public inquiry into the Thatcher government’s role into 1984. We already know Sikhs were betrayed for financial gain, because trade trumped human rights. The real focus must surely be justice for the victims, by lobbying for a UN-led inquiry into human rights violations by the then Indian government, on similar lines to one supported by Britain for Sri Lanka’s massacre of Tamils. Why are groups like the Sikh Federation (SFUK) aiming for the wrong target? Following the 2014 disclosures David Cameron instructed Cabinet Secretary Sir Jeremy Heywood to conduct an internal government review of documents related to British involvement in the run up to Operation Blue Star. After the Heywood review, Lord Singh was invited to meet the Cabinet Secretary on 21 January 2014. He explained the hurt and sense of betrayal felt by UK Sikhs over the revelations of British government involvement. The Cabinet Secretary’s response was that his task was simply to look at all documentation and report accordingly. When Lord Singh mentioned he’d seen documents showing the only concern of the then government seemed to be a lack of support for the Indian government might jeopardise arms exports, he received the astonishing response from the Cabinet Secretary that he and his team, ‘were unaware of any arms trade implications in the papers.’ Lord Singh responded that he had seen several references to arms sales to India being under threat, and at the Cabinet Secretary’s request, gave his office details of a Cabinet document dated, 22 November 1984, referring to a five billion pound arms contract. Sir Jeremy Heywood was additionally informed that Lord Singh had met a former Cabinet member back in November 1984, to express concern over the UK government’s silence over the widespread organised killing of Sikhs throughout India. The staggering response was, ‘Indarjit, we know exactly what is going on, it’s very difficult; we’re walking on a tightrope: we have already lost one important contract’. Deeply unsatisfied with Warsi’s response Lord Singh tabled a debate on the 3 March 2014 in the House of Lords. Concluding his speech he said, ‘I urge the Government to add their support for an open, independent inquiry into the massacre or genocide of Sikhs in 1984 in the same way that they are backing a UN-led inquiry into the killing of Tamils in Sri Lanka. Against this, all offers of government assistance and offers to talk to Sikhs pale into an unnecessary distraction.’ Making no commitment to Lord Singh’s request, Baroness Warsi reiterated views expressed in her undated letter following the 4 February 2014 meeting – in short SAS advice was not given for commercial gain. Later that month on 26 March 2014, during Prime Minister’s Questions, David Cameron was asked what more Britain could do to get justice for victims of 1984. He responded by saying the events in Amritsar continue to be a ‘deep source of pain to Sikhs everywhere’ and ‘a stain on the post-independence history of India.’ He went on, ‘The most important thing we can do in this country is celebrate the immense contribution that British Sikhs make to our country, to our armed forces, to our culture and to our business life and celebrate what they do for this country.’ It was this blanket dismissal of Sikh human rights, which led to the NSO’s decision to boycott the Downing Street Vaisakhi function that year. Unsurprisingly other’s shamefully attended for photo opportunities. 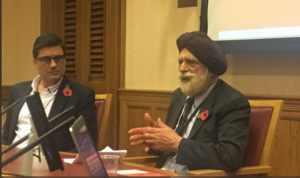 We have studied the SFUK’s recent report ‘Sacrificing Sikhs’, which was launched at the APPG for British Sikhs by Preet Gill MP on 1 November 2017. It provides a significant amount of detail from previously undisclosed papers, supporting what we already know about the then British government’s foreign policy agenda – that is trade with India trumped Sikh human rights. The author Phil Miller, who was commissioned by the SFUK, says the British government is yet to declassify documents relating to India after 1985. The SFUK are pushing for further disclosure, and a full inquiry into the then British government’s involvement. We see little point in lobbying for a full inquiry or disclosure of further documents. Here’s why: Lord Saville who chaired the ten-year Bloody Sunday Inquiry and sits with Lord Singh as a crossbencher, dismissed any further inquiry into the UK role as futile. He said thirty years of looking for further information would get us no further forward. We urge Sikhs to rather focus their attention on getting justice for the surviving victims and their families via a UN-led inquiry into human rights abuses of the then Indian government. This is achievable, as its already been done for Sri Lanka, and Britain had an important role in lobbying for a UNHRC probe into the massacre of Tamils. Those with vested interests in UK party politics will no doubt continue to lobby Theresa May’s government for a full inquiry into the Thatcher government’s role – but they are willfully misguided.